As we all know ﻿the 76th Masters Tournament is underway at Augusta National Golf Club in Georgia! 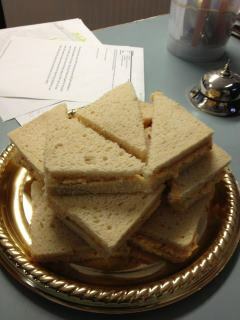 Of course I brought in homemade Pimento Cheese Sandwiches ~ a southern staple at Augusta ~ for today's Goldie Bounce Golf segment on The South Shore's Morning News! Follow all the action Live online at The Masters official website ﻿too!